The November Update for Forza Motorsport 7 is coming on Tuesday, November 6! 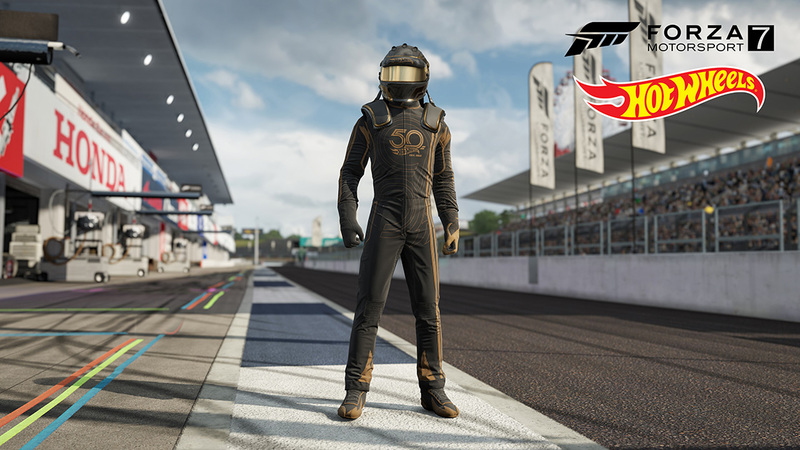 This month, Forza 7 players will notice some significant changes to the game based on our ongoing communication with the Forza community. First up, prize crates have been officially removed from Forza Motorsport 7; in their place, we’ve added a new Race Shop feature, where players can grab items like Driver Gear, Mod cards, and more. In addition, we’ve made some important changes to collisions in Forza Motorsport 7, which will improve both the single- and multiplayer experiences for all drivers. 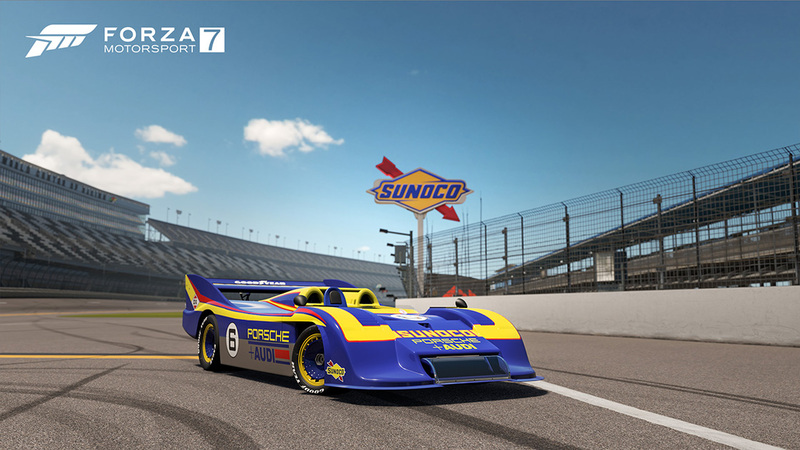 All that, plus a ton of Hot Wheels fun coming to players this month and a classic Porsche prototype race car that serves as our November Spotlight Car. The age of Can-Am cars was an era of unparalleled speed. The 917/30 driven by Mark Donahue broke A.J Foyt’s closed course record-setting a speed of 221.120, a record that stood for nearly 20 years. It wasn’t just the power, it was the weight of the 917 – a scant 1,765 pounds – that made this car so formidable. It could go from 0 to 60mph in 2.1 seconds, 0 to 100 mph in 3.9 seconds, and 0 to 200 mph in 13.4 seconds. In 1973 those numbers set the 917/30 apart; 45 years later, this classic Porsche racer still astounds. 1) We’ve improved energy dissipation between bodies, as well as the way tire friction is calculated during a collision. This is a global change, which results in “softer” collisions, where collisions absorb energy and the collision impulse happens over a longer period of time. 2) In multiplayer events, collisions are now resolved locally and blended when the game receives an update from other player(s) in the same multiplayer match. Effectively this means that multiplayer collisions now work like single-player collisions, even in high-latency scenarios. 3) A new Collision Assist setting scales the amount of body rotation a car can impart on another car in a crash. Players can choose to turn the Collision Assist on or off and players will have the option to create lobbies that use this assist (or ones that do not). This collision assist is meant to curb griefing; and a car hit by a car with this assist engaged will also receive the assist. The sum of these changes means that contact and collisions feel much different in Forza 7 with this update. Car contact when side by side will result in fewer spins; tandem drifters will find that their cars will be more tolerant of tiny taps than before, and griefers dive-bombing into Turn 1 will have less of an effect on the rest of the field than before. In all, the new collision model is meant to bring car-to-car contact more in line with the real world, and also make the experience for players of all skill levels that much better. Prize crates are gone and the Race Shop is here! The new Race Shop feature gives players the option to purchase Mod cards, Driver Gear, and Badges whenever they like. The Race Shop is found in a new tile on the main menu page of Forza Motorsport 7. The item lineup in the Race Shop is a mixture of Mod cards, Driver Gear, and badges, and the inventory for the Race Shop refreshes every six minutes. In the Race Shop, players can purchase items using in-game credits. These items will vary in cost based on the type of item and its rarity. Driver Gear and badges appearing in the Race Shop that a player already owns will be shown darkened out and won’t be available for purchase, but players will be able to purchase Mod cards that they might already have in their collection. One important note for new Forza 7 players: As we announced in Friday’s edition of the Week in Review, we’ve replaced the prize crates that were part of our Forza Rewards programs for new Forza 7 players with Mod cards. New players will now receive Race Mod cards, depending on their Forza Rewards Tier level. Hot Wheels arrive in Forza Motorsport 7! Seven Hot Wheels models arrive tomorrow with the November update. This epic collection of cars is part of our epic celebration of Hot Wheels’ 50th anniversary. In addition to legendary Hot Wheels vehicles like the Twin Mill and the Bone Shaker, we’ve got a few new-to-Forza Hot Wheels 50th anniversary rides like the 1970 Hot Wheels Chevrolet Corvette ZR-1, the 1969 Hot Wheels Chevrolet Camaro Super Sport Coupe and the 1963 Hot Wheels Volkswagen Beetle. In addition to the above, we’ll have a new Hot Wheels Race Day hopper featuring Hot Wheels cars, as well as new Hot Wheels Leagues starring the Rip Rod and the Ford Mustang. Finally, we’ve got another epic Bounty Hunter ladder event waiting in November; in fact, this is the biggest event in Bounty Hunter history, with a total of nine Turn 10 bounties for the community to chase. Players will be driving the 2016 Dodge Viper ACR on Watkins Glen Short Alt when the event kicks off on November 9, so get your practice in now!